Tarbert Comprehensive were drawn against Castleisland Community College and Presentation Milltown in the opening group games of the Munster Seniors Schools competition. The first game was at home to Castleisland CC which was played in Shannon Park, Tarbert. Despite it been Tarberts first game of the year they put in a great performance and ran out convincing winners. Next up was an away game to Presentation Milltown. It proved to be a fantastic game of football with many county players on both teams. It was the North Kerry girls that proved to be the stronger side and won on a score line of 4-12 to 3-10. Now the Tarbert girls had topped their group and awaited the draw for the Quarter Final of Munster. 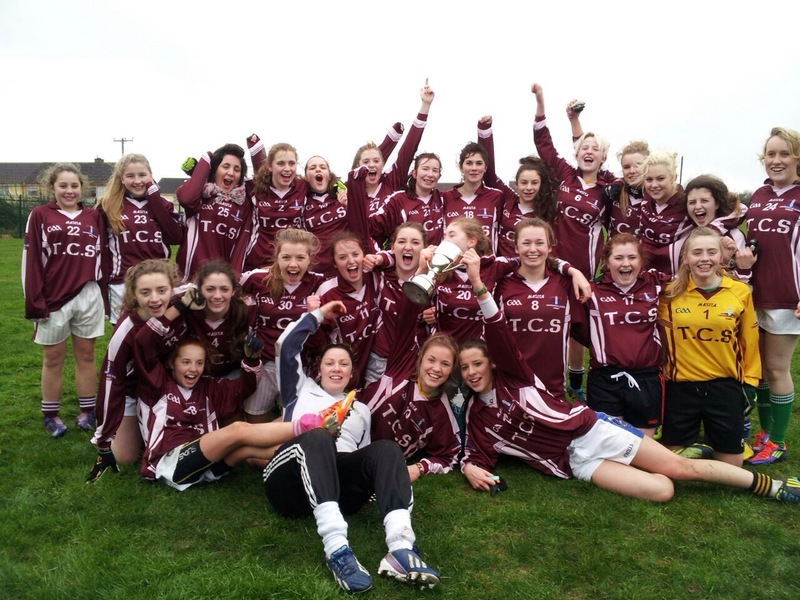 Tarbert drew Mary Immaculate School in Lisdoonvarna in the Quarter Final. This game was played in Mungret, Co Limerick as all games from this stage on when be in neutral venues. Tarbert Comprehensive travelled to Mungret at full strength and put in a huge performance. Despite been two points down at half time it was the North Kerry girls who drove on in the second half with a strong overall team performance and came out winners on a score line of 5-8 to 3-7. Next up was a Munster Semi Final for the girls and Tarbert were drawn against Rockwell College, Co Tipperary. Tarbert travelled to Monaleen in Limerick to take on Rockwell in a game where Rockwell were hot favourites. Tarbert played against the breeze for the first half and were down nine points at half time. The Tarbert girls regrouped at half time and put in a massive performance in the second half. Tarbert got a few early scores and found themselves back in the game. The North Kerry girls never gave up and substitutes were brought on and made a huge difference. With five minutes to go Tarbert got the equaliser and with time nearly up Tarbert scored a point and came out as winners on a score line of 3-10 to 5-3. Tarbert now awaited their opponents for the Munster Final. On Tuesday the 14th of January Tarbert Comprehensive travelled to Mannix College, Charleville to take on Carrigaline in the Munster decider. Carrigaline took the early initiative and led by four points to no score. Tarbert started to impose themselves with the half back line attacking more. This gave midfielder Niamh Carmody a chance to link with her teammates Erin Finucane and Kellie Sheehy to drive towards the Carrigaline goals and dispatch the ball to the back of the net. This score settled the Tarbert girls and from the resulting kick out they attacked again and slotted the ball over the bar. A positional change between Sophie Lynch and Ashlea Sheehy resulted in more pressure for the Carrigaline backs which gave the opportunity for Sophie to pick off two great points. Both teams exchanged further points before Gene Buckley blow the half time whistle to leave the score Tarbert 1-7 to Carrigaline 1-6. As the teams took to the field for the second half, it was Tarbert despite playing against a strong breeze who got off to the better start. Tarberts wing forward Rebekah Garvey got an early goal following a good passage of play by the North Kerry girls which put Tarbert four points up. Carrigaline began to come back into the game with Ellen Twomey and Kayleigh O Connor being the driving forces and kicking some great scores. Tarbert started to bring in fresh legs who all made an immediate impact. Laura Stack entered the fray at corner forward and struck for Tarberts third goal with only minutes remaining. Carrigaline never gave up and continuously attacked the Tarbert goals, but great goalkeeping by Niamh Kilkenny and a dominant full back line withstood the Carrigaline pressure. Joyous scenes followed when the full time whistle was blown and Tarbert Comprehensive School were crowned Munster Champions on a score line of 3-10 to 1-12. Munster Ladies Treasurer, Dan O Mahony was on hand to present Player of the Match to Niamh Carmody who was also Tarbert Comprehensive captain. Team: Niamh Kilkenny, Aine Walsh, Rachel Collins, Rachel Moriarty, Moira O Flaherty, Katie Wallace, Sophie Lynch (0-2), Niamh Carmody(1-6, 4f), Ashlea Sheehy, Erin Finucane (0-1), Kellie Sheehy, Rebekah Garvey (1-0), Aisling Finucane (0-1), Charlotte O Neill, Muirne Wall. Subs used: Margaret Mulvihill for Charlotte O Neill, Laura Stack (1-0) for Aisling Finucane, Lisa Mulvihill for Kellie Sheehy and Vicki Moore for Aine Walsh. A huge congratulations to Niamh Carmody Ballylongford who has recently been on trials for the Munster Senior Schools Interprovincial Team at various venues at has been successful and made the final panel. A 25-strong panel has been chosen to represent Munster next Saturday the 25th in Mullingar, Co Westmeath. Best of luck to Niamh and all the team. Best of luck to the Tarbert Junior Girls who are awaiting their opponents for the Munster Junior Schools Semi Final. This is due to be played next week. who was also Tarbert Comprehensive captain.